Before this morning gets away from me, I thought I’d provide two humanities updates taking place in the great state of North Dakota, central North America. The first is a link-reference to the progress of our Punk Archaeology manuscript; and the second concerns the official press release from NDSU’s Center for Heritage Renewal on our continued Dakota book discussions. 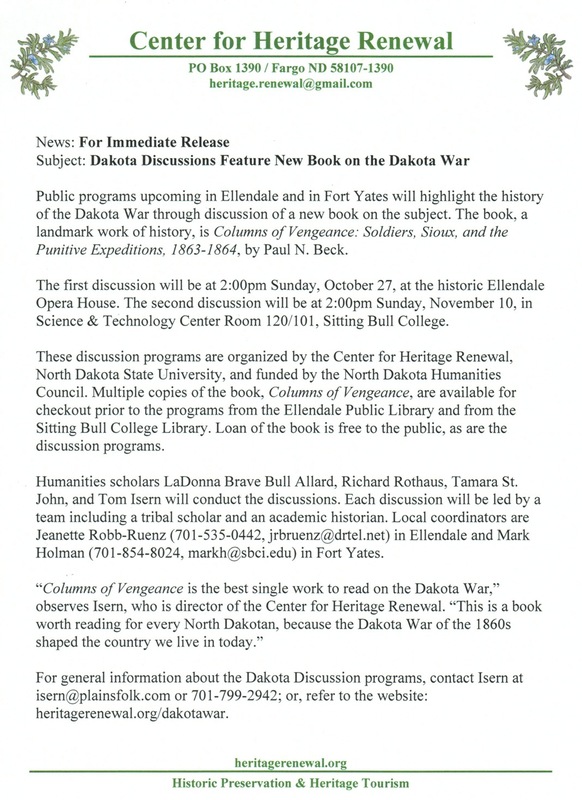 Of this latter, the discussions bring together the public and scholars to consider the Dakota Conflict and the subsequent punitive campaigns from 1862-1864, and where we, Native and non-Native relations, are today. For more details, check out the uploaded hand-bill image to the left. Of this, the most recent discussion took place this Sunday past at the Opera House in Ellendale, Dickey County, North Dakota. This brought out a variety of topics, and the most attentive-grabbing and engaging at all of these events is that of Native historians and knowledge-keepers and scholars. After Tamara St. John, a Native historian and genealogist, spoke at this event, an attendee remarked on how (and I’m paraphrasing) they are starved for this kind of information. For those of us up to our elbows in the history and historiography of the US-Dakota Conflict and Wars, we understand and often wrestle with accurate and precise and appropriate terminology, definitions, and so on. When we chat about this stuff with non-specialists, one of the most common remarks I have heard is this: “How come we weren’t taught any of this — attempted genocide, attempts at cultural destruction, attempts at forced assimilation — in our public education here in North Dakota, Minnesota and South Dakota?” I’m uncertain. But I do always insist on using attempts and attempted when talking about genocide, cultural destruction and assimilation. I do this because the Dakota, Lakota and Nakota, the Seven Council Fires, are alive and well today. We are pushing ahead as well with these discussions, and every time we have another conversation and chance to talk about this, legitimate history is happening. And if that is happening, so is that large, amorphous thing we call culture and the humanities. When it comes to the public school systems, I’m sure there are plenty of politics behind all of the curriculum decisions from yesteryear and now. Perhaps that is something we in the future can consider, and perhaps in the future bring before various departments of public instruction in Minnesota, North Dakota and South Dakota. That would be at least one long-range goal to consider. Nonetheless, the next discussion will be held at 2:00PM (CST) on November 10, 2013, at Sitting Bull College, in the Science and Technology Center Room 120/101, Fort Yates, Standing Rock Reservation, North Dakota. 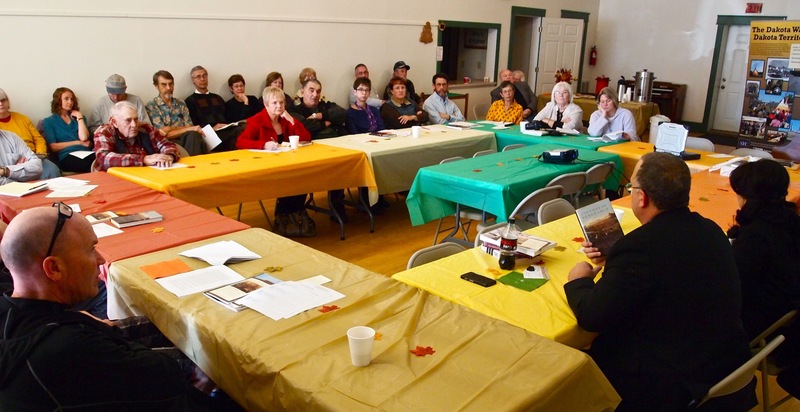 And here is a photo from the discussion from last Sunday.